California earthquake coverage and claims changed radically after the 1994 Northridge Earthquake. Mega losses by insurers spawned the creation of the California Earthquake Authority (CEA), a state-run earthquake insurance pool. Since 70% of all earthquake policies sold in California are CEA member plans. See what you will learn. In 2004, the California Department of Insurance adopted regulations governing the training of insurance adjusters in evaluating damage caused by earthquakes. These regulations can be found in the California Code of Regulations, Title 10, Chapter 5, Sub-chapter 7.5.1. Before you can handle earthquake claims in California you need to be Certified and meet other requirements as well. Get Earthquake Certified. (Satisfied by completing our CEQ course). Get Fair Claims Settlement Certified (Satisfied by completing our CEQ course). 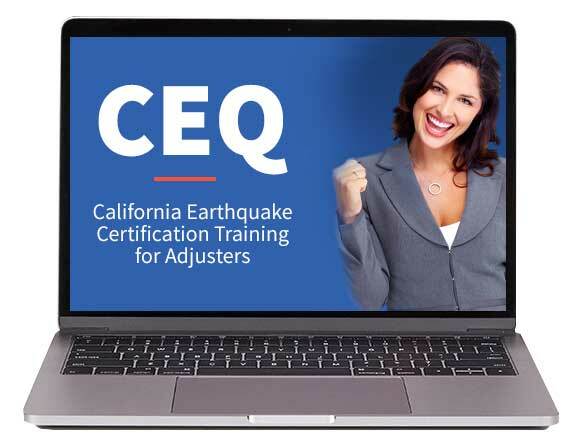 Get Earthquake Certified (Satisfied by completing our CEQ course). Take the CEA Claims Representative Online Training Courses. NOTE: The online CEA course you must take is called Homeowners Coverage Training. CEA currently has 2012 & 2106 versions of this course. You must take both versions to comply with CEA rules.